This is the US Sibley chart with transits and progressions for this Tuesday, the release date of CIA documents by Wikileaks dubbed "Vault 7, Year Zero". These documents reveal massive spying activity against the American people by the US government, far in excess of the past revelations of such activity by Edward Snowden. Progressed Moon conjunct US Ascendant: something previously hidden (in the Twelfth House) comes to light. 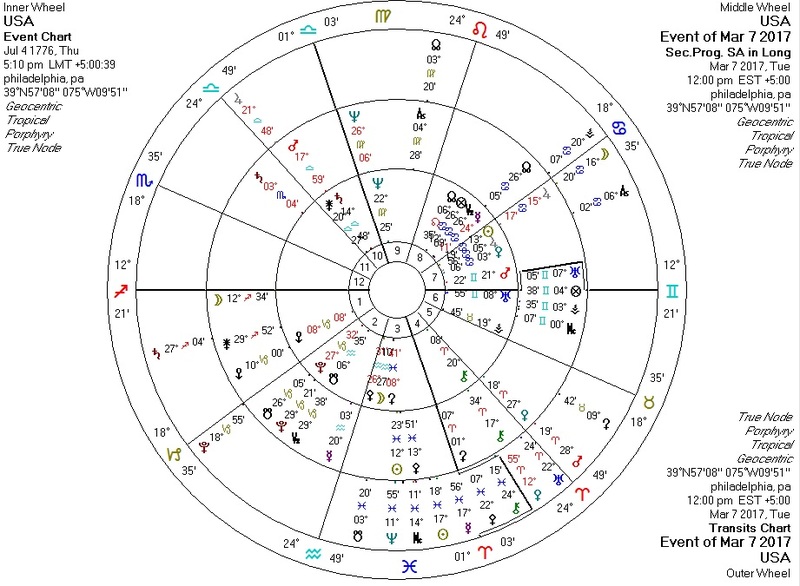 Transiting Uranus in Aries (triggered by opposition from Jupiter) quincunx US Neptune in Virgo in the Ninth: unexpected technologically related action against covert media spying. Transiting Pallas opposite US Neptune in Virgo in the Ninth: covert media spying, opposed by ethics. Transiting Sun and Mercury quincunx progressed Mars in Libra in the Tenth: communication regarding government action in the social sphere.